I read Balzac and the Little Chinese Seamstress a ways back, and in a way there are very similar tones to this story, as it also takes place during the Cultural Revolution in China. 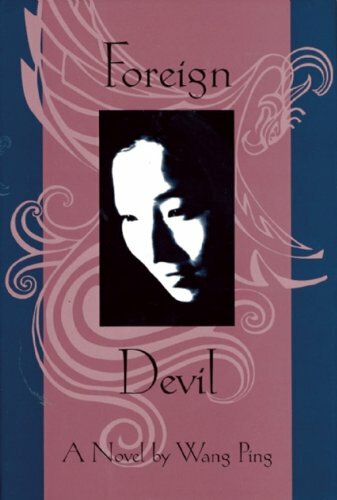 Ni Bing is a strange girl, the “Foreign Devil” of the title. She grows up a virtual slave to her mother, who shows her very little love and gives her the burden of taking care of all sorts of house chores from the time she is a little girl. There is a mystery about her birth that will only be revealed towards the end. Ni Bing's greatest ambition is to go to college, and to that effect she chooses to be reeducated in the countryside for a number of years. The narrative weaves between present and past, with many, many unsavory things happening to Ni Bing as a child. Once in college, she is seduced by a married man who promises her the moon. This novel weighed heavily on me. The bad stuff was described in a way that you could certainly feel, whether it was the flavor, the smell of something, or the very frequent pains that Ni Bing suffered. The asphyxiating atmosphere that pervaded everything, the allegiance to the Revolution, the suspicions around you, all very masterly portrayed. China was, at that time, a Big Brother state. But don't get the wrong idea: although there are unsavory moments and descriptions, there is a lot of beauty for sure. Ni Bing is a very sensitive person, and extremely strong, and you end up admiring her. My favorite part of the book is when she finally makes up with her paternal grandmother, who had so abused her as a child. By the way, in this section the binding of feet is explained in good detail. The cruelty of it, juxtaposed to the sweetness that grandmother and granddaughter show to each other at this point in their lives, brought tears to my eyes. This is not a fairytale by any means, but a story of struggle and determination, and from what I understand, fairly autobiographical. I cannot believe Wang Ping's mother tongue is NOT English, she wrote this so well. Yet again, why should I be surprised? Ni Bing would have written it with the same mastery. Check out Wang Ping's website: fantastic! Do not miss the photographs. 1. Please let me know your shipping restrictions. 2. Journal the book when you get it. 3. If you can't finish this book in ~ 4 weeks, please let me know. 4. Make your Journal Entry. 5. PM the next person in line before you send it to make sure they are still interested in participating. 6. PM the next person in line after you have actually mailed the book. Midlifecrisis (UK) - Europe pref. I got this in the mail today. Thanks for sending it. I plan to start reading it soon. This book made me appreciate my childhood even more. There are some difficult relationships in this story. The main character had great strength to survive as well as she did. I have e-mailed the next person in line and will send it off ASAP. Thanks for setting up this bookray! It has arrived. Looking forward to reading this one. Thank you nynjagrrrl for sending it to me. This was an excellent book in terms of understanding the atrocities of the Cultural Revolution, especially in regards to women. I have read a couple of other books; one, years ago, written by someone who was half Chinese and who lived in China during this time. Also, I know someone personally who lived through this period. She would have been a few years older than the main character of this story and has related to me many of the absurdities she experienced. I am so glad that I had the opportunity to read this book. It is sensitively written and the strength of Ni Bing is very admirable. Thank you GeorgeousGlo for sharing it. This book is now on its way by surface mail to quak in Germany. It was going to cost $28.00 by air, so I opted for $12.00 by surface mail. It may take anywhere from six to eight weeks to arrive. Got it today. Thanks so much to loveamystery for sending it the long way. And thanks for the ring, GorgeousGlo. I'm already looking forward to reading the book. Update 16.Jan.2008: Sorry for keeping the book so long. I finally read in about a week and I liked it. It is a touching story about a life full of obstacles. The story about Ni Bings birth was interesting and I had never hinted it. I didn't really understand why she loved Yan and stayed with him. But maybe she just knew something else. It actually is a sad story with a really open ending. What was very interesting are the infos about how life was during the cultural revolution. Some very absurd things happened there. It is very shocking to read about how poor people were. And it's even worse that there are still many people (in China and in other countries) living under such really bad conditions. I already asked for the next address and hope to send the book within this or the next week. The book has arrived here in Helsinki safe and sound. Thank you, Quak! I enjoyed reading the book! The story was fascinating and well written. I have also read Balzac and the Little Chinese Seamstress, Red Azalea as well as Farewell to My Concubine, where the stories are set in the time of Cultural Revolution. Those books are on my favourite books list and this one will be on it too! So far the best read this year- next going to start Khaled Hosseini´s A Thousand Splendid Suns. Thanks for sharing the book with me! I´ll contact Aspen72 for her address. Book arrived today, thank you! I liked the story in the end, even though I had to push myself to reading within the first half of the book, finding it so slow and one-step-forward-two-steps-backward -style. In general, not only in this book, there was the view to virginity which I find a bit disgusting and unfair what comes to women - as it does not seem to be important for men in any culture that I've heard of. There was also quite much violence in different levels. But the narrator's search for lifepath and relationship to her father gave quite much warmth - in the end the narrator in a way grew up. The latter half of the book was fascinating and interesting, giving some enlightment to life in China in 1980's. I felt it a bit strange that situation was so terrible then, as it's not so far away, things happened during my childhood, I mean. I started to wait for some description of 'Tiananmen Square protests', but as they were in 1989, they didn't fit in the book timeframe. Even nowadays, there is no 'free speech' in China, I wonder how long this situation will last. Quite topical reading what comes to current news from Tibet and China. I'll post the book to Norway within this week. I'll journal again when I've read the book. I started reading this on Thursday, April 3rd. I've read about half so far - it's a fascinating read. I finished this book on Saturday, April 12th. This was an excellent read, rather painful at times, but a well told story and very believable. Unfortunately. It seemed a very realistic portrait of life in China during that time. Completely absurd, yes ... but that's how it was. And to quite an extent probably still is. This book gives a good window onto what totalitarianism has to offer, so to speak, in many ways. Ni Bing has a lot of personal strength to be able to survive all that she goes through. She is a very well rounded character, I ended up both liking and admiring her as well as being annoyed by her and disliking her. :-) There are many good characters in this novel, this was one of the main strengths of the book. I found the characters generally very believable. The plot was a little hard to follow at first as it keeps jumping back and forth between different time periods and places (and with such strange place names, of course, to a Western reader :-) ... but as someone already mentioned it does become easier to follow as you read on. Definitely a worthwhile read. Hoping to get stormlilly's address soon and get the book travelling again. The book is finally on its way to England ... !! Sorry for being so slow to mail it!! Thanks for sharing, GG, and happy reading, stormlilly! I received this book today: all the way from Norway. I'm looking forward to getting started. I'm so sorry I've had this book for 2 months- I was in a car crash and everything went a bit pear shaped and i forgot about the book. Thanks for the reminder. I really want to read it and I'm on holiday starting Weds! Yeah- I should be able to read it within a week and will post it on immediately. I've PM'd for the next address on the list. I have it all packed up and ready to go- just need the address! Thank you - this actually arrived a couple of days ago but I have only just been able to get to the post office to collect it. I have a few ahead in the queue but will read and journal again as soon as I can. Foreign Devil has arrived safe and sound. On its way to Ilios. Happy reading! Hello! Just got the book yesterday! I have two other rings in front of it, but I'll start reading it as soon as I can. I will update this entry once I am done. I am halfway through the book. I am contacting JDT today to make sure I get an address and keep this book moving ASAP. Thank you for your patience. This book presents a very familiar topic for me: a woman's coming of age tale in communist China and how she breaks away from the accepted customs to become her own person. It reminded me of Red Azalea and Wild Swans. The story really focuses on Ni Bing, the main character. Through flashbacks, we learn about her difficult childhood, the conflicts within her family, and the way she met her current boyfriend - a married man who manipulates her to keep her right where he wants her. We follow her struggle to get an education at a time when who goes to college is decided by your "political qualifications". She also tries to uncover the secrets behind the frayed relationships in her family. I really enjoyed this book and would definitely read others from the same author. The depiction of Ni Bing's relationship with her father and hre paternal grandmother were very touching, particularly the last few chapters when we witness the reconciliation. I am sending this book out next week. I have the next BXer's address ready to go. This long-travelling book arrived safely today! Thanks to all before me. just realized I've read this one awhile ago! End of the bookray, and GorgeousGlo suggested I share or wild release it! continuing this book's journey - released to caligula03 who plans to wild release at her favorite coffee place.